With the prices of beef, pork, and chicken all on the rise this year, budget-concious cooks have to try a little harder to keep costs under control. When it comes to chicken, three things can usually save you money: skin, bones, and dark meat. (Buying larger “value packs” can also save money, but food waste can be a bigger issue if you live alone.) Bonus: those cost-saving traits also make for tastier meat. I love chicken leg quarters as single-serving, economical main dishes that also taste great. Four quarters costs about $5, regularly priced. For this recipe, I used low-sodium soy sauce, which provides a flavorful foundation. Workhorse seasonings – garlic and onion powder, Lawry’s seasoning, and pepper — go with everything and cost (at most) pennies per meal. Paired with your choice of seasonal vegetables, this entire meal can easily come together for under $10, or $2.50 per serving. Preheat oven to 375 degrees. Line a 9×13 baking dish with foil. Trim any excess fat from chicken. Use your fingers to separate the skin from the meat, eithout completely detaching it (you will end up with a “flap” of skin). Using a silicone basting brush, generously brush soy sauce under skin. Season with garlic powder, onion powder, and seasoning salt. 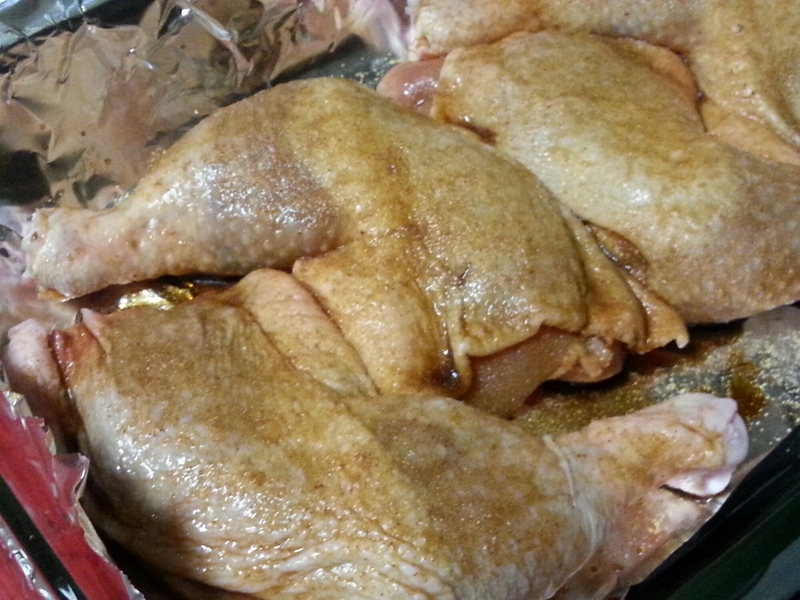 Arrange chicken skin-side up in baking dish. Generously brush with additional soy sauce. Sprinkle with seasoning salt and pepper. Bake at 375 degrees for 1 hour. 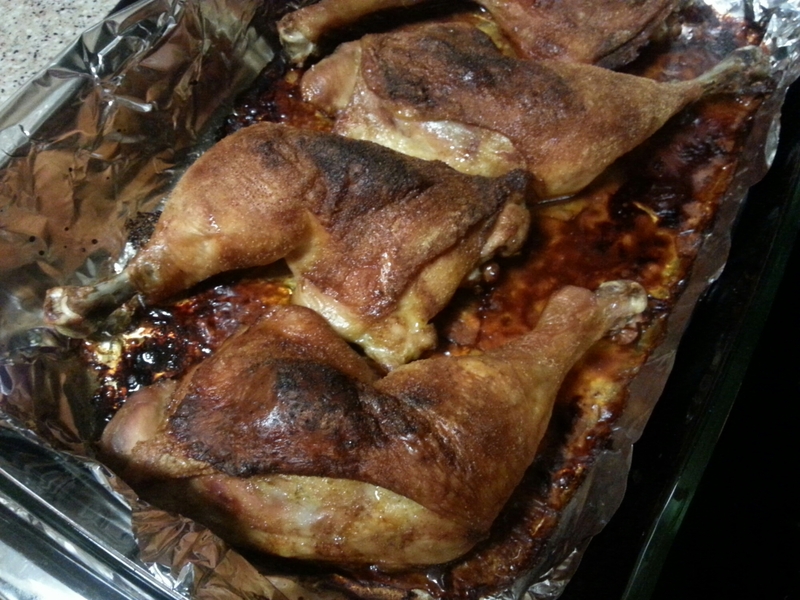 Increase temperature to 400 degrees; bake an additional 15 minutes until chicken is done and skin is crispy. Let sit 5 minutes before serving.